This photo was taken by CHGC Member Geoff at Pozieres, France, the site of one of the greatest battles ever fought by Australian soldiers. Over seven weeks in mid-1916, at the Battle of the Somme, and very near to where these poppies were growing, the Australian Imperial Force suffered 23,000 casualties, 6,700 of whom died. 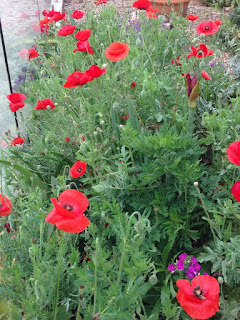 A favourite heirloom flower and one of the most widely recognised flowers for its significance in honouring fallen soldiers on Remembrance Day. It's always one of the first spring flowers to bloom on the battlefields of France, and it's commonly said to symbolise the blood of lost soldiers. Images from Sue Young are current year's flowers. Some further reading on why this flower was chosen for distribution among members of CHGC. 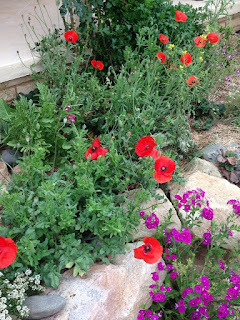 Also another link when Papaver rhoeas was flower of the month. Images from this post were supplied by then members Bob & Gaye. 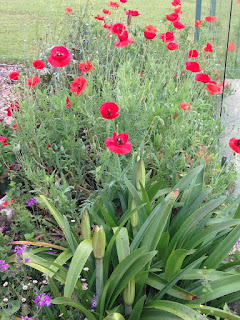 Jennifer Stackhouse has written an article on Annual poppies and friends. Visit GardenDrum for this article.